Since starting our in-depth accounts of football's past, one era has fascinated me more than any other. It may be to some surprise that the period of time I am referring to is that before 1900 with the very origins of the sport. It is in this infancy of the game where we see the beginnings of a craze that would eventually take over the world. In a months time we will see the first round of the 2014/15 FA Cup - the 134th season in which the tournament has taken place. In the modern day it is often referred to as football's greatest competition and one which theoretically anyone can win, a notion described as "the magic of the cup." Has this statement always been accurate, and just how was the competition received in its earliest days? In the present day, the FA Cup has began to once more divide opinion; Is it the tournament it once was? There is no doubt with the vast commercialization and emergence of continental cups like the Champions League that it has shown evidence of becoming watered-down. It has even started to see a number of 'big' clubs play weakened sides in order to preserve players for the Premier League and Europe. Despite this, there is no doubt that the "Football Association Challenge Cup" still holds an aura of invincibility formed in part from its very beginnings in Victorian England. "Football Association Challenge Cup. -At the general meeting of the Football Association, held yesterday, Mr. C. Morley in the chair, after the settlement of the rules the ties of those clubs which have already stated their intention to compete for the challenge cup were drawn in the following order : -Wanderers v. Harrow Chequers, Civil Service v. Barnes, Crystal Palace v. Hitchin, Queen's Park (Glasgow) v. Donnington Grammar School, Royal Engineers v. Reigate Priory, Upton Park v. Clapham Rovers." From the post above, two things are clear - the teams involved were predominately public-school educated and based in the south of the country. These sides were strictly amateur, the idea of professionalism within the sport was one alien for at least another 10 years. Football was a gift, one which was to played for the sake of playing rather than be tainted by any monetary offers. The inaugural competition was won by The Wanderers, after they defeated Royal Engineers 1-0 at the Kennington Oval in London. The attendance was a mere 2,000 - a far cry from the 90,000 regularly seen today at Wembley. "The officers at the Royal Engineers and the celebrated Wanderers played their final contest for the Association Challenge Cup. There was a vast number of spectators, including many ladies in the tent, and there were several open landaus on the ground. The ball was kicked off at three o'clock, and after a scrimmage the Wanderers got the ball down towards the Engineers, who had a downfall of their lines by a well-directed kick by E. Chequers. Many battles were fought with no other result...It was a perfectly one- sided match, the Wanderers taking it comparatively easy. The Engineers could never get within many yards of their opponents' quarters." By 1872, as well as the first FA Cup Final - the first ever international football match took place between England and Scotland. Despite playing out a rather dull 0-0 the match led to the possibility of future encounters and greater tournament participation from Scottish sides like Queen's Park (only denied a place in the 1872 final due to financial difficulties). The Wanderers would continue to dominate the competition the following year defeating Oxford University in the final, before the latter would indeed emerge as champions the next season, beating the Royal Engineers 2-0. The Royal Engineers would eventually win the FA Cup, beating Old Etonians in a replay in 1875. It is evident that the first cup finals were relatively modest affairs, at least in terms of spectators. For example, the 1877 Final between The Wanderers and Oxford University saw a total of 3000 pack into Kennington Oval. Without doubt this was a decent number for a sport in its infancy, but it is intriguing to compare football with other British sports like lawn tennis. Lawn Tennis was only 'invented' by Walter Wingfield three years before 1877, but by the year in question had already seen the emergence of its first major competition - The All England Championships at Wimbledon. The first men's singles final may have only seen 200 spectators, but by 1884 a female tournament had been founded with 3000 people in attendance. It may be unfair to compare football's infancy with that of tennis, but how did the sport eventually become the mass spectator event we see today? The answer is simple -it was its encapturing of the working class which gave it an advantage over any rivals. What is interesting to see developing is that by the formation of the Football League in 1888, every side in England's top flight is from the Midlands and further north. Why was this? The answer can be found from within the FA Cup and the gradual increase in professionalism. It was in 1882 that the FA Cup changed forever as Blackburn Rovers reached the final to face Old Etonians. Rovers lost (somewhat a surprise, perhaps the magic of the cup was prevalent), but it marked the first occasion in which a Northern 'Working Class' team had progressed to Kennington, was the southern public school dominance coming to an end? "The play all round was singularly fast and scientific, the turf being in admirable working order, the weather being beautifully fine, and the enthusiastic crowd that thronged around the enclosure must have exceeded five thousand spectators. The Rovers, who during the season have won thirty-one matches and drawn four, were naturally the favourites. So confident in their prowess were they, and, indeed, the Lancashire folk in general, that they brought to town with them a song in honour of their expected victory, which had been printed for general dissemination among the Cockneys after the triumph." "A great point is agitating the football world just now, and is coming prominently forward among the London clubs. The system of county contests and cup ties has made football more popular than ever, and the large sums earned in the way of gate money has produced a new species, the football professional. In Glasgow and the Midlands he has been known for some time, and one of the great dangers in the way of crack club visiting other districts has been that their best men may be got at and induced to change their quarters and their club for "consideration." The point now agitating Londoners whether they can play with towns containing professional footballers." The growth of the tournament can also be seen by the sheer number of teams entering the competition. 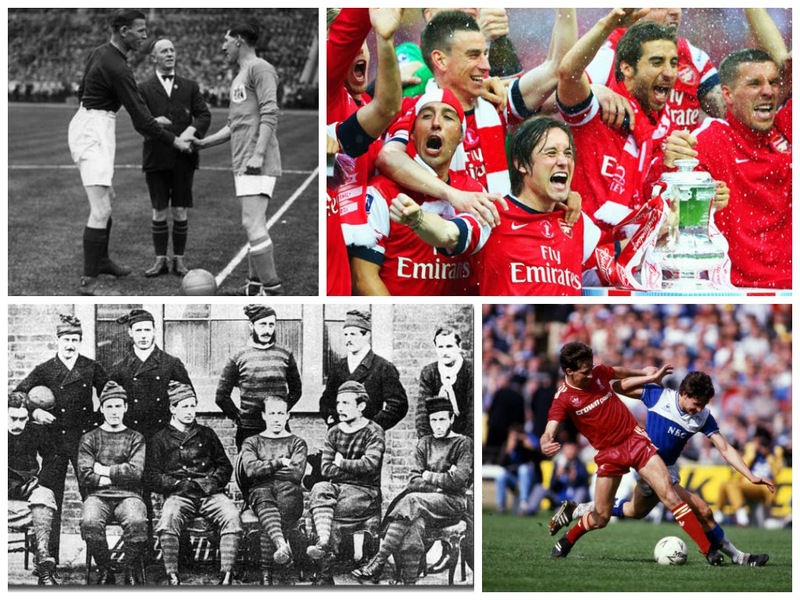 By 1885 teams from England, Scotland and Wales were all to be found taking part in the FA Cup. The Cup was now a chance to highlight local pride over public school alliances, with the competition forming the opportunity for communities to join together in support of their respective teams. In 1888 (where we end this blog) 149 sides had registered to take part compared to the 15 when the tournament began in 1871. Football had clearly grown into a game which people, both rich and poor generally wanted to excel in, and wanted to watch. 2012 saw a rematch for 1872! This time the Real Engineers won! Through the FA Cup, football had began to become the national sport, seriously rivaling cricket but one which was eventually swamped by social division. What is most intriguing is that despite one early turbulence, the Football Association Challenge Cup is still here, and still the competition which every players wants to win, whether they be from Britain or abroad. Without it, it is hard to see the subsequent development of the Football League and the general spread of the beautiful game to all corners of the globe. So there we have it, the origins of the FA Cup - a competition introduced by gentlemen, developed by the masses.